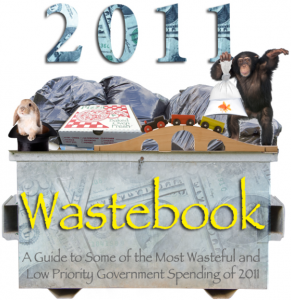 We’ve previously highlighted some of the content of Senator James Coburn’s Wastebook project, but in introducing the 2011 edition when it came out, we skipped over some of the lower dollar expenditures that, well, were just really wacky. Like a $592,000 study on why chimpanzees throw poop! Fortunately, Money Morning’s David Zeiler didn’t skip over these line items. Instead, in addition to the chimp-poop-throwing study, he summarized seventeen more of the earmarked expenditures that professional politicians put forward that fall into the “What?! They spent money on what? !” category of government spending. Exporting Elmo: The U.S. Agency for International Development provided $10 million to a Pakistani arts organization to adapt “Sesame Street” for Pakistani toddlers. The money will also help pay for the creation of 130 episodes of the show. Cowboy Poetry: It’s hard to recall John Wayne reciting verse in any of the many Westerns he made, but cowboy poetry is a big enough phenomenon to have its own annual celebration. And this year taxpayers helped pay for it courtesy of a $50,000 contribution from the U.S. government. O Christmas Tree: The U.S. government spent $74,000 last year to help the state of Michigan “increase awareness about the role Michigan plays in the production of trees and poinsettias.” Michigan’s $40 million Christmas tree industry already ranks third in the nation. Jobs for Barbados: The mixed success the government has had creating jobs here in America did not discourage the U.S. Agency for International Development from spending $1.35 million on an “entrepreneurship initiative” for the Caribbean island nation of Barbados. The U.S. unemployment rate has been over 8% for three years. What Were They Smoking: The Virginia Commonwealth University received $55,000 in 2011 (part of a larger $170,000 grant) to study changes in the hookah smoking habits of students in the nation of Jordan. Among other things, the study sought to answer the question: “How many Jordanian students believe that water pipe tobacco smoking is more harmful than cigarettes smoking?” (Answer: 62.2 percent). Chinese Puzzle: The Chinese economy is second only to that of the United States. And China holds billions of dollars in U.S. debt. So the U.S. government sent $17.8 million in aid to China last year to improve the Asian giant’s social services and clean up its environment. That makes sense, right? By the way, the researchers studying why chimps throw poop have theorized that it’s a form of communication. Maybe they’re trying to send a message to Washington. 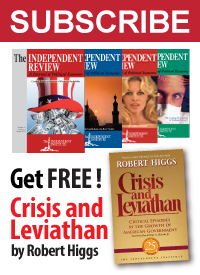 Read Senator Coburn’s full report on wasteful federal government spending here!